Each day in cooking class we prepare at least one or two appetizers, a sign that it’s time to open a bottle of wine and relax. And this is a perennial favorite. Throughout Provence anchoïade (anchovy cream) is a popular starter, often used as a dip for a selection of raw vegetables. Recipes vary dramatically from cook to cook and I like to keep mine simple, with just a trio of ingredients: top-quality anchovy fillets cured in olive oil, capers, and cream. A mini food processor or a standard food processor fitted with a small bowl. Combine the ingredients in the bowl of the food processor or a blender and process to a chunky consistency. Use as a dip for raw vegetables, to prepare Anchovy Bites (recipe in The French Kitchen Cookbook), or as a sandwich spread. Until I began growing eggplant, I had no idea how vibrant, smoky, and intense it could be, so fresh and firm, picked just seconds before preparation. Come August, my garden flourishes with those shiny black, lean and long vegetables, hanging from their neat little tree-like plants, ready for the oven, the skillet, the grill. I like to harvest them small, when I feel the flavor is more intense. This roasted eggplant buried in a spicy tomato sauce is a personal favorite, with multiple variations. I like to serve it as a vegetarian main dish, sometimes showered with cubes of feta cheese and warmed just until the cheese begins to melt. The dish could also serve as a pasta sauce: chop the eggplant as it comes from the oven, then drop the cubes into the tomato sauce. Cumin, ginger, and pepper flakes have their place here as model partners to the versatile eggplant. A baking sheet; a large, deep skillet with a lid. 1. Center a rack in the oven. Preheat the oven to 425°F (220°C). 2. Trim and discard the stem ends of the eggplants. Halve them lengthwise. Brush the flesh lightly with some of the oil and season lightly with salt. Place the eggplant halves, cut side down, on a baking sheet. Place in the oven and bake until the eggplant skin is soft and wrinkled and the cut side is golden, about 30 minutes. 3. When the eggplants have almost finished cooking, prepare the sauce: In the skillet, combine the onions, garlic, the remaining oil, and salt to taste. Toss to thoroughly coat the onions and garlic with the oil, and sweat – cook, covered, over low heat until soft and translucent – about 5 minutes. Add the ginger, pepper flakes, and cumin, and toss to evenly coat the onions. Add the tomatoes with juices and simmer, covered, for about 5 minutes. 4. Add the roasted eggplant halves, burying them, cut side down, in the sauce. Cover and cook until the eggplant is very tender and has absorbed much of the sauce, about 20 minutes. If using, add the cubes of feta cheese, warming the dish until the cheese melts. Taste for seasoning. Serve. I am not sure why, but a thick, juicy côte de boeuf calls for a party: a simple but festive meal enjoyed with friends around the table, a sturdy red wine, and a simple green salad. This recipe demands no more gadgetry than a well-seasoned skillet. Walter remembers watching his father cook steaks, and he always heated coarse sea salt and waited until it “danced” before cooking the meat. It’s an uncomplicated but sure-fire way to ensure a thick, flavorful crust on one of our favorite cuts of meat. A griddle, seasoned cast iron skillet, or heavy-duty skillet. 1. Remove the meat from the refrigerator at least 4 hours before cooking. 2. When you are ready to cook the beef, preheat the griddle or skillet over high heat for 2 minutes. Scatter the coarse sea salt on the griddle and heat until the salt “dances,” or begins to pop, about 3 minutes. Then add the meat, unseasoned, and cook for 4 minutes on one side. Turn the meat, season the seared side with pepper and cook for 4 minutes more for rare meat, or cook to desired doneness. 4. To serve, carve into thick slices. Serve with lemon. Three rules here: sear, season, rest. Searing caramelizes the sugar and browns the proteins on the surface of the meat, resulting in more intense flavors and an attractive crust. The salt does help begin to season the meat, but because the pan is extremely hot, the meat begins to sear immediately, forming a crust that prevents the salt from drawing moisture from the steak. The final seasoning makes for meat that tastes seasoned not salted. Resting allows the juices to retreat back into the meat, resulting in beef that is moist and tender, not dry. Bring out a sturdy red that will stand up to the forward flavors of well-cooked beef. With this meat I like to uncork our winemaker Yves Gras’s stellar cuveé, Gigondas Prestige des Hautes Garrigues. The wine is a blend of 80 percent old-vine Grenache, 15 percent Mourvedre, 3 percent Syrah, and 1 percent Cinsaut. It’s aged for 2 years in oak barrels and oak tanks, and bottled without filtration. A perfect match for a perfectly cooked steak. This is a “Monday night special” in our cooking class in Provence. Our local butcher supplies the most delicious, meaty duck breasts, and a variety of fresh figs are in season from June to October. This super-easy all-purpose sauce could also be used on any grilled or roasted poultry. I use a good-quality balsamic vinegar here, but nothing super-thick or aged. Two brands that I most respect are Rustichella d’Abbruzzo and Leonardi. A warmed platter; 4 warmed dinner plates. 1. Stand each fig, stem end up, on a cutting board. Trim off and discard the stem end of the fig. Make an X-shaped incision into each fig, cutting about one-third of the way down through the fruit. 2. Remove the duck from the refrigerator 10 minutes before cooking. With a sharp knife, make about 10 diagonal incisions in the skin of each duck breast. Make about 10 additional diagonal incisions to create a crisscross pattern. The cuts should be deep, but should not go all the way through to the flesh. (The scoring will help the fat melt while cooking and will stop the duck breast from shrinking up as it cooks.) Season the breasts all over with salt and pepper. 3. Heat a dry skillet over medium heat. When the pan is warm place the breasts, skin side down, in the pan. Reduce the heat to low and cook gently until the skin is a uniform, deep golden brown, about 3 minutes. Carefully remove and discard the fat in the pan. Cook the breasts skin side up for 10 minutes more for medium-rare duck, or cook to desired doneness. 4. Remove the duck from the skillet and place the breasts side-by-side on the warmed platter. Season generously with salt and pepper. Tent loosely with foil and let the duck rest for at least 10 minutes, to allow the juices to retreat back into the meat. 5. In a small saucepan, combine the vinegar and the crème de cassis, and warm over low heat. 6. In a saucepan that will hold the figs snugly, arrange them tightly in a single layer, cut end up. Pour the warm vinegar mixture over the figs and cook over low heat, basting the figs with the liquid, for about 3 minutes. 7. Cut the duck breasts on the diagonal into thick slices, and arrange on the warmed dinner plates. Spoon the sauce over the duck slices, and arrange the figs alongside. Serve. Almost any good southern Rhône red would be perfect here. Cassis is an overriding flavor in the wines of the region; try the Côtes-du-Rhône- Villages Cairanne from the Domaine de l’Oratoire Saint Martin, the Réserve des Seigneurs, loaded with the spice of red and black currants as well as kirsch. Substitute cherries for the figs, and Cherry eau-de-vie for the crème de cassis. Sitting on the terrace of the bustling Roman trattoria Dal Bolognese one sunny Sunday in May, I relished a version of this classic dish, pungent with freshly ground black pepper and enriched with a mixture of sheep’s milk Pecorino cheese and Parmigiano-Reggiano. We were dining with our friends George Germon and Johanne Killeen, and George noted that this is one of the hardest pastas to get right, probably because it is so basic and appears easy. The pepper flavor should be dominant, but should not overwhelm the palate. We eat pasta at least once a week, and this is one of my “Go To” preparations, since it goes together in a matter of minutes and is such a thoroughly satisfying dish. A 10-quart (10 l) pasta pot fitted with a colander; 4 warmed, shallow soup bowls. 1. Place the pepper in a large skillet over a medium heat and toast it, shaking the pan, until fragrant, about 30 seconds. Add the oil and the butter and stir until the butter is melted. Remove from the heat. 2. In the pasta pot, bring 8 quarts (8 l) of water to a rolling boil over high heat. Add the salt and the pasta, stirring to prevent the pasta from sticking. Cook until tender but firm to the bite. Remove the pasta pot from the heat. Remove the colander and drain the pasta over the sink, shaking to remove the excess water. Reserve some of the cooking water for the sauce. 3. Return the skillet to the heat. Add about 4 tablespoons of the pasta water to the oil mixture and stir to blend. Add the pasta and toss until it is evenly coated. Add the cheeses and toss until the pasta is evenly coated. If the pasta is dry, add more pasta water. Serve immediately, with additional grated Pecorino and Parmigiano on the side. Buy the best peppercorns you can find. I favor the highly aromatic Tellicherry pepper from Malabar, off the coast of India, and love its spiciness, hint of wood, and lingering scent. The berries are left on the vines a bit longer, so they develop a deep, rich flavor. The peppercorns from The Spice House (thespicehouse.com) are fabulous and reliable. And do invest in a good pepper mill, one that will coarsely grind the peppercorns. I use a battery-powered Peugeot mill. Peugot mills are readily available in gourmet shops. (Note I have no affiliation with these brands, they are just the ones I like and chose to use in my kitchen). 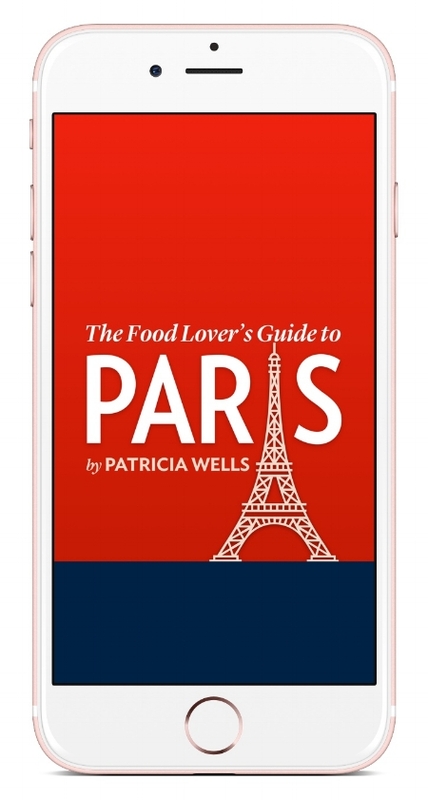 This recipe was first published in The French Kitchen Cookbook: Recipes and Lessons from Paris and Provence. All rights reserved. Please do not reproduce without permission. There are evenings when I crave pizza but don’t have the time to prepare it. That’s when I turn to this pasta dish, one that has all my favorite pizza toppings turned into a sauce, which I affectionately call Pizza Pasta. Penne is the preferred pasta here, for it’s sturdy enough to stand up to the rustic trimmings. A 10-quart (10 l) pasta pot fitted with a colander; 6 warmed, shallow soup bowls. 1. In the pasta pot, bring 8 quarts (8 l) of water to a rolling boil over high heat. Add the salt and the pasta, stirring to prevent the pasta from sticking. Cook until tender but firm to the bite. 2. Meanwhile, in a saucepan that is large enough to hold the cooked pasta, combine the tomatoes sauce or canned tomatoes, rosemary, olives, artichokes, capers and fennel seeds. Simmer while the pasta is cooking. 3. When the pasta is cooked, remove the pot from the heat. Remove the colander and drain the pasta over the sink, shaking to remove the excess water. Immediately transfer the drained pasta to the sauce in the saucepan. Toss to evenly coat the pasta. Cover and let rest for 1 to 2 minutes to allow the pasta to thoroughly absorb the sauce. Taste for seasoning. Transfer to the warmed soup bowls, and garnish with the cheese and basil. Pass the red pepper flakes. A favorite household red is the inky-purple Vacqueyras, the southern Rhône wine from Domaine des Amouriers. Their Les Genestes is a typical blend of Grenache, Syrah, and Mourvedre, with lots of spice that marries well with this pasta dish. Recipe demonstration begins at 32:18. Neither my students nor I ever tire of this salad. It has all the qualities one looks for in a dish: crunch, smoothness, color, aroma. Serve with Crispy Flatbread (page 260 of Salad as a Meal), Tortilla Crisps (page 263 of Salad as a Meal) or toasted bread for added crunch. Don’t omit the fresh thyme here, for it plays an essential role in the color and aroma. A small jar with a lid; a mandoline or a very sharp knife. 1. In the jar, combine the lemon juice and flavored salt. Cover with the lid and shake to blend. Add the oil, and shake to blend. 2. With a mandoline or sharp knife, slice the zucchini lengthwise as thin as possible. Arrange the slices on a platter, and pour the dressing over them. Tilt the platter back and forth to coat the slices evenly. Cover with plastic wrap and let marinate at room temperature for 30 minutes, so the zucchini absorbs the dressing and does not dry out. 3. Halve, pit, and peel the avocado, and cut it lengthwise into very thin slices. Carefully arrange the slices of marinated zucchini on individual salad plates, alternating with the avocado slices, slightly overlapping them. Sprinkle with the pistachio nuts. Garnish with the thyme sprigs and flowers and fleur de sel. Serve. Favorite wine partners for avocado include a young Pinot Grigio, a crisp-style Chardonnay, and a fragrant, well-chilled Sauvignon Blanc. This recipe was first published in Salad as a Meal. A small jar with a lid. Place the lemon juice and salt in the jar. Cover and shake to dissolve the salt. Add the oil and shake to blend. Taste for seasoning. (Store in the refrigerator for up to 1 week.) Shake again at serving time to create a thick emulsion. 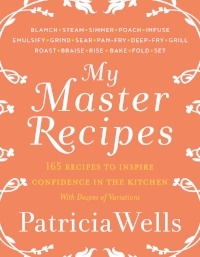 These recipes were first published in The French Kitchen Cookbook. In summer, if the conditions are right, my vegetable garden will usually produce enough heirloom tomatoes to feed an army. Among my preferred varieties are kaki coing, black prince, noire de crimée, and striped germain with their dramatic colors and gentle acidity. But whether market bought or from my homegrown bounty, this simple platter is a favorite way to enjoy a tomato's fresh juicy sweetness. Here I have topped the tomato slices with ruffles of the firm Swiss cheese Tête de Moine, shaved with a special machine called a girolle, but any cheese of choice can be used here. A cheese girolle, a mandolin or a very sharp knife; a large serving platter. 6 thin ruffles of Tête de Moine cheese, created with a cheese girolle or cut into paper-thin slices with a mandoline or a very sharp knife. Arrange the tomatoes in overlapping layers on the serving platter. Garnish with the cheese and herbs. Drizzle the dressing over all and season lightly with fleur de sel. Eight 1/2-cup (125 ml) canning jars with lids. 1. Stem the kumquats, halve them lengthwise, and remove and discard the seeds. 2. In a large saucepan, combine the kumquats, orange juice, and sugar. Bring to a simmer and simmer, skimming the surface as needed, until the juice is thick and the kumquats are soft and translucent, about 1 hour. Skim off and discard any recalcitrant seeds that float to the surface. Let cool. A small jar, with a lid. 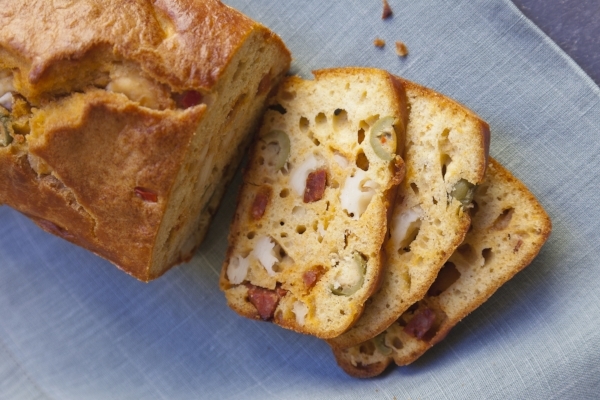 This quick bread takes you on an instant trip to Spain. I love this sliced and toasted, with more cheese and chorizo on top as a welcome snack. A nonstick 1-quart (1 l) rectangular bread pan. 1. Center a rack in the oven. Preheat the oven to 400°F (200°C). Lightly oil the pan. 2. In a large bowl, combine the flour, baking powder, and salt. Mix to blend. In another bowl whisk together the eggs, oil, and yogurt. In a third bowl, toss together the cheese, chorizo, paprika, and olives. Add the egg mixture to the flour mixture and stir to blend. Add the cheese mixture to the flour mixture and stir to blend. Add the cheese mixture and stir to blend. Omit the cheese and chorizo and replace them with 1 tablespoon toasted ground cumin and 1 tablespoon toasted whole cumin seeds; or, for Curry Bread, omit the cheese and chorizo and replace with 1 tablespoon Homemade Curry Powder (page 282 of The French Kitchen Cookbook). These recipes were originally published in Salad as a Meal. A baking stone; a steamer; a wooden pizza peel; a metal pizza peel or large metal spatula (If you don’t have a baking stone and a wooden peel, simply sprinkle the polenta on a baking sheet, place the round of dough on top, assemble the tart, and bake on the baking sheet). 2. Separate the onions into rings. You should have about 4 cups (1 liter) loosely packed onions. 3. Bring 1 quart (1 liter) of water to a simmer in the bottom of a steamer. Place the onions on the steaming rack. Place the rack over simmering water, cover, and steam until the onions are al dente 5 to 6 minutes. Remove the basket from the steamer to drain the onions. (This can be done 2 to 3 hours before serving. 4. In a large dry skillet, brown the pancetta over moderate heat until crisp and golden, 3 to 4 minutes. With a slotted spoon, transfer the pancetta to several layers of paper towels to absorb the fat. Blot the top of the pancetta with several layers of paper towel to absorb any additional fat.5. In a medium bowl combine the yogurt, nutmeg, onions, and half of the pancetta. Stir to blend. 6. On a generously floured work surface, roll the dough into a 12- inch (30 cm) round. 7. Sprinkle the wooden pizza peel with polenta and place the round of dough on the peel. Working quickly to keep the dough from sticking, assemble the tart: Spread the yogurt mixture evenly over the dough. Sprinkle with the remaining pancetta. 8. Slide the dough off the peel and onto the baking stone. Bake until the dough is crisp and golden, and the top is bubbly, about 10 minutes. 9. With the metal pizza peel or large spatula, remove the tart from the baking stone. Sprinkle generously with pepper. Transfer to a cutting board and cut into 8 wedges. Serve immediately. A young, fresh dry Alsatian Riesling is in order here: Try one from the reputable firms of Ostertag or Zind-Humbrecht – crisp, dry, smoky wines with a saline touch of chalky minerality, an even match for the creamy onion and pancetta mixture offset with a hit of black pepper. This recipe were originally published in Salad as a Meal. This fool-proof, totally versatile no-knead dough is a staple in my kitchen. It can be made a few minutes ahead or days before. Made quickly in the food processor with instant yeast, it requires no kneading and is ready to use immediately for a rustic family pizza (page 283 of My Master Recipes), or with just a quick rise, for pinwheel loaves (page 285 of My Master Recipes) and focaccia (page 289 of My Master Recipes), fresh from your own oven! A measuring cup with a pouring spout; a food processor. 1. In a cup with a pouring spout, combine the water and the oil. 2. In the food processor, combine the flour, yeast, and salt. Pulse to blend. Add the liquid slowly through the feed tube, pulsing just before the dough forms a ball, 15 to 20 seconds. You may not need all the liquid. (If the dough is too wet, add a bit more flour. If it is too dry, add a bit more liquid). 3. Transfer the dough to a clean work surface and form into a ball. The dough should be soft. Divide the dough into 2 equal balls. The dough can be used immediately, or can be stored in a airtight container refrigerated, for up to 5 days. Punch down the dough as necessary. This recipe was first published in My Master Recipes. This light, colorful vegetarian weeknight dinner is a favorite, inspired by my annual visits to my “boot camp” Rancho la Puerta in Tecate, Mexico. This soothing, comfort-food dinner knows few rivals, particularly in cold weather. A 1-quart (1 l) gratin dish, 4 warmed dinner plates. 3. Prepare the tomato garnish: In a large skillet, combine the onion, 2 tablespoons of the olive oil, and the remaining 1/2 teaspoon sea salt and sweat – cook, covered over low heat until soft and translucent – about 5 minutes. With a large pair of scissors, cut the tomatoes in the can into small pieces. Add the bay leaves and tomatoes and their juices and cook, covered, over low heat for about 15 minutes. Taste for seasoning. 4. At serving time, heat 2 tablespoons of the oil in a large skillet until hot but not smoking. Cut the polenta into 8 even squares. Sear each square on both sides until golden, about 2 minutes per side. Transfer the squares to the warmed plates, stacking the second slice at an angle over the first. Spoon the sauce all over. Garnish with parsley and cheese. An inexpensive everyday dish suggests an equally fine but gently priced wine. A favorite is Michel and Stephane Ogier’s La Rosine Syrah, a deep purple vin de pays from the hillsides north of the old Roman town of Vienne. 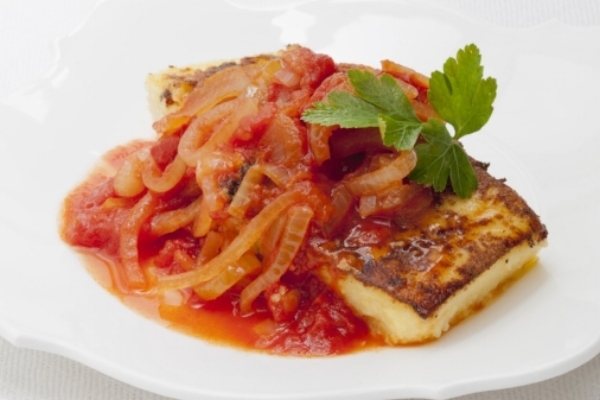 Both the tomato sauce and the polenta can be prepared up to 3 days in advance, then covered and refrigerated separately. Reheat at serving time.